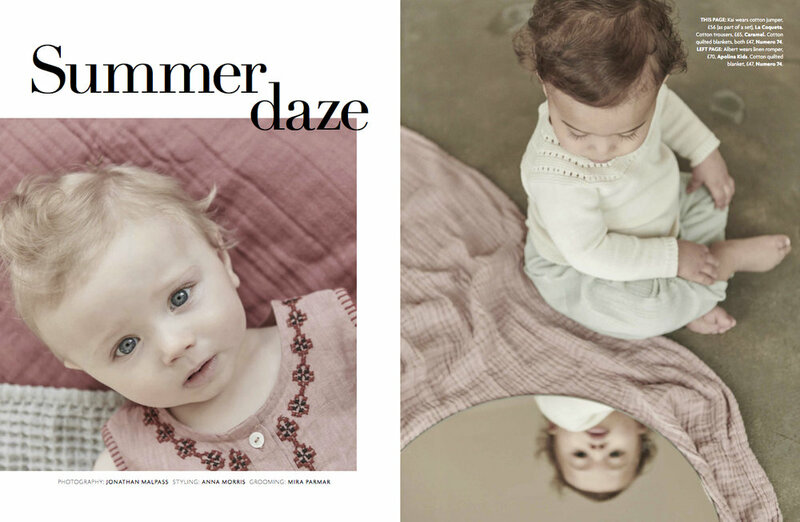 My styling for this story for Baby London was inspired by the interest in natural fabrics in kidswear right now. All the gorgeous organic cottons, linens and muslin fabrics which are kind on skin and look beautiful. There are also some lovely floral prints on the high street and in designer collections right now. It's been a busy old couple of months, weddings, flat moves, honeymoon...since the beginning of April life has been full on in the best possible way. We are finally settled into our new flat, (furniture and all!) So I can share with you the work I managed to cram in amongst the madness. First up a trip to my all time favourite place on earth, beautiful Brighton beach. It may now have large pole with a spaceship attached but it's still my happy place. Using cotton candy coloured S/S17 collections from Caramel, Noe&Zoe, Boden, alexandalexa.com, childrensalon.com and Harrods for this Smallish magazine editorial with Jonathon Malpass and Rose Angus on hair and face duty,we finished off the shoot with chips and Mr Whippys for good measure. Exploring the theme of Play with Julia Bostock for Enfant Terrible magazine took us to East London for some traditional fun and games, marbles, handstands and hide and seek. Quite a lot of fun was also had with this shoot for Hooligans Blog, shot by Damian Weilers with hair by Lynda Darragh, with clothing from Bobo Choses, Hello Simone, Milk and Biscuits, Scotch R'Belle and Molo. As Bobo says #ChoosePlay. A few months ago we went to the Hundred Acre Wood to shoot a story for December's Smallish Magazine and here it is! The story was based around the idea of Scandinavian magic and having fun being part of nature. Shot by Emma Tunbrige with beauty by Rose Angus. My summer holiday this year was booked for the end of September, which meant being able to make the most of London in the summer, which is delightful as long as you can avoid the tube. I love Soho in bright sunlight, the V&A's courtyard where children (and the occasional grownup) paddle freely, park picnics spent sheltering under trees from unexpected showers and evenings spent drinking on rooftops and pavements. The holiday however was worth the wait. We visited Saint Malo in Brittany, northern France, travelling rather quaintly by overnight ferry. There was something magical about going to sleep in our dinky cabin, complete with bunk beds and waking up to sunrise and the boat just docking on Saint Malo's historic coast. The harbour was just outside of the walled citadel and surrounded by little islands accessible by foot at low tide. We spent the week slowly exploring the walled town, running around the ramparts by night, swimming at low tide when the sea was shallow and warm(ish) across the sands and obviously eating and drinking all the croissants, cheese and red wine we could get hold of. Our AirBnB on one of the most historic streets, Rue Chateaubriand just off the main square was the perfect spot to explore from. We didn't take many photos as for once we enjoyed leaving our phones at the flat while we were out and about, although I did get a snap of my Saltwater sandals looking much more at home on the rocks of Saint Malo than on the streets of London. As well as the the abundance of Bretagne shops, carrying more striped Breton tees than I've seen in my life. Saint Malo had a few shopping gems. One of the cobbled streets contained contemporary classics Maje, Gerard Darrel, Petit Bateau and Des Petits Hauts which I'd never been into before and immediately fell in love with! Their softly tailored pastel clothing and sparkly accessories combined with pastel pink store, made for dreamy shopping. They don't ship to the UK sadly but the whole range is available from Smallable, which does ship. La Maison Generale which was located dangerously close to our apartment stocked a enviable array of homewear, rustic and chic in equal parts with an addition of a few choice mens and womens clothing brands. Cargo Culte Cafe Brocante, cafe/wine bar/vintage shop, everything in this place was for sale and I came away grinning with happiness after the tastiest meal ('Carnivore salad' with duck 3 ways!) and clutching a vintage French educational poster featuring fruits and legumes, which will sit in pride of place when I eventually have my dream farmhouse kitchen.